Thank you for your interest in Luca! The two beautiful private dining rooms at Luca, The Garden Room and The Pasta Room, are suitable for a variety of functions and can accommodate up to 10 guests. Luca is the new Italian restaurant in Clerkenwell, from the team behind the award winning, The Clove Club. The ambience is relaxed and the design breathes warmth and elegance. The Garden Room and The Pasta Room are situated in the heart of the restaurant and allow for varying degrees of privacy – perfect if you don’t want to miss out on the buzz and atmosphere of the main restaurant. We offer a choice of menus that reflect the beauty of traditional Italian feasting, with seasonality and regional provenance at the fore. Antipasti, freshly made pasta and roasted meats and fish are complimented by regional Italian wines and a fine selection of Grappa and Amaro. Book for lunch or dinner, with clients or friends – Luca is the perfect spot for all occasions. 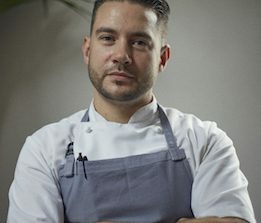 We’ve been speaking with Robert Chambers, Head Chef at Luca Italian restaurant in Clerkenwell. Robert shares his influences & tricks of the trade.